A number of the leading intellectuals in Yemen are facing a cruel media war against them by unknown groups. Most probably, the group is loyal to ex-preseident Saleh and the Islamist political party, Islah. Why the media war against them? All of them have always expressed their critique to Saleh's regim and Islah party. 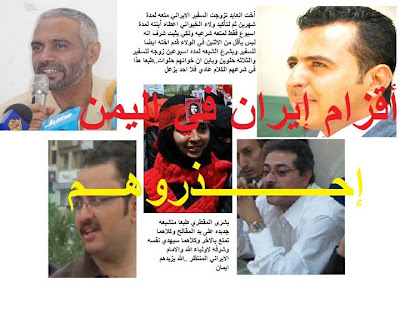 The intellectuals (shown in the picture) are socialist activist and journalist, Mohammed Al-Maqaleh, socialist activist and writer, Bushra al-Maqtari, prominent journalist, Abdulkarim al-Khaiwani, cartoonist, Kamal Sharaf and TV presenter, Abdulrahamn al-A'abed. The photo above portray all the mentioned figures with a text saying that most of them are Shi'ite and spys of Iran in Yemen. The text also contains very degrading accusations. This is not the first time such events take place. Almost every dissident figure in Yemen has been subjected to a media war or/and physical harassment.